Knight is one of chess soldier that stand behind Pawns row and together with main soldier, the Knight has duty to protect the King from their opponent. In a set of chess, you will get two Knights that stand on the right and left side of the King. The Knight is the only piece that is able to pass over another chess piece. The directional movement of the Knight is based on the letter L. At each moving opportunity, the Knight has potentially eight squares it can move to or capture at. Its unique moving offset by its unique shapes. The Knight has designed looks like horse. So that some people called it as Horse chess pieces. On the picture is one example of our knight chess pieces. It is in black and glossy look. It has made of Teak wood and carved by professional craftsman. 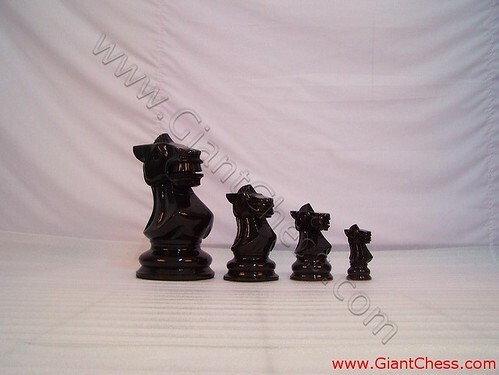 We present the Knight pieces in different sizes to show you that as chess manufacturer, we provide chess pieces in various sizes. Not only standard size, but we also have the giant one. Get it now!